Put your unused space to work. 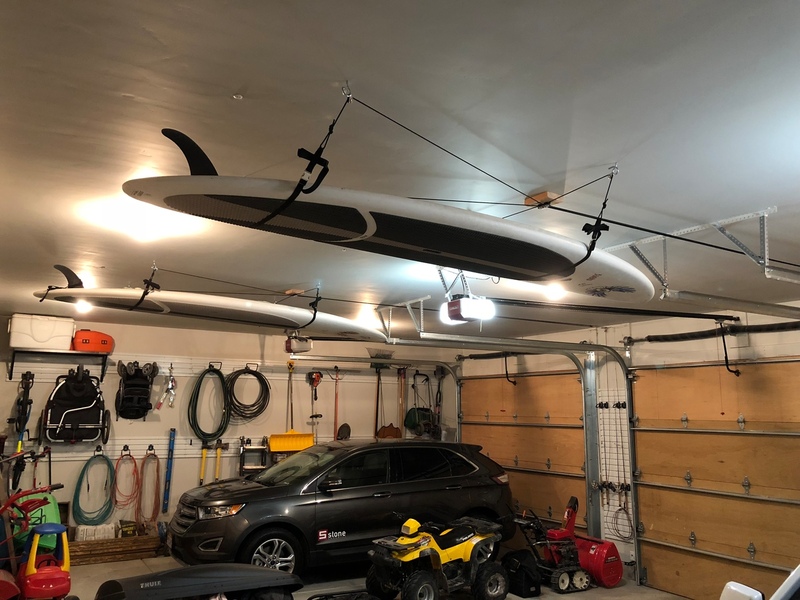 The SUP Ceiling Hoist is the easiest way to store your paddleboard out of the way. Eliminates the need to stretch overhead while conveniently storing your board up and away. This premium 4-point lift kit is in a league of its own when it comes to quality. The hoist kit comes with precision pulleys, stainless steel hardware, locking cleat, and high strength rope to ensure your SUP will stay safe. Perfect for high ceilings! Select 1 of 2 height capacities. 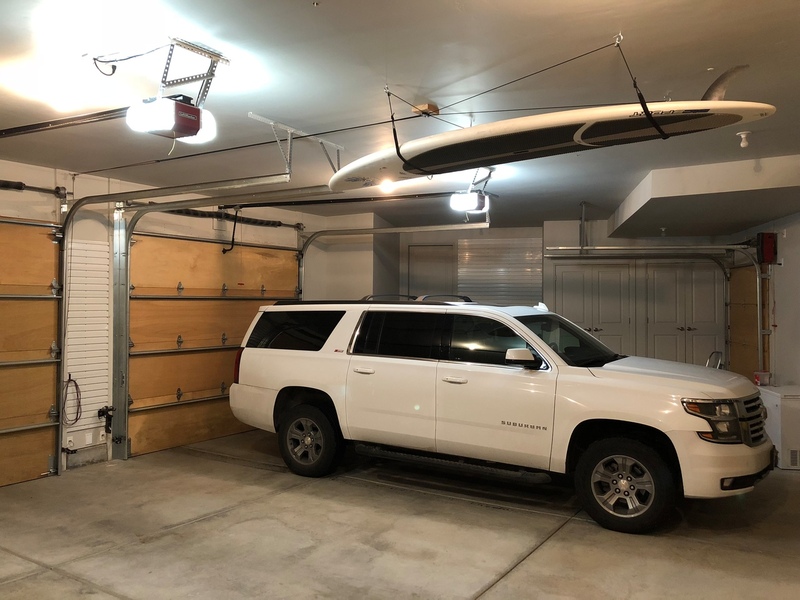 For those with standard 8' or 9' foot garage ceilings, the 10' lift will work perfectly for hauling your board up to the rafters. 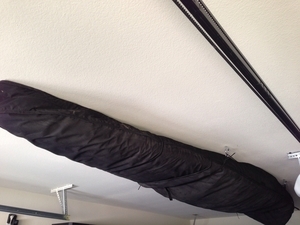 But now we're also offering the 16' hoist for those with extra high ceilings (barns, storage sheds, etc). The product's height designation is directed at ceiling height, not rope length. So the 16' listing will work with any ceiling height up to 16'. Select from the dropdown menu above for the appropriate product. Simple, 1-person operation. The hoist is easily operated by one person and has a self-locking safety cleat that grips the rope instantly in case of accidental release. The 4-point system provides a stable and more secure way to store your board over a 2-point system. The hoist includes soft webbing straps that run underneath your board's hull to prevent any abrasions or distortion for long term storage. Max load = 45lbs; minimum load must be 10 lbs. Put two of these in my garage 6 months ago and they have saved a ton of space. I mounted them a little different for aesthetics. I can raise the boards without issue but it’s a little tough for my wife and kids but doable. Would be nice if it had another gear for ease and a way to organize the cord once it is raised. I was tired of tripping over husband's board in garage. Found this on your site. Shipped fast. Handyman installed it in a couple hours. Perfect solution! Works great! Marriage saved. A friend who has installed 5 of these, and I installed this 4 pointer sup hoist last week. The installation went smoothly as he knew to pay attention to the length needed for the lift and tie off point for the rope. Otherwise, with a bit of rope adjusting, the sup is up and out of the way finally. My friend said all i needed was a 2 point hoist so I have extra super holding power for the light sup. I was a little concerned about my ability to install the entire hoist system to the roof of the garage. I am handy, but by no means a professional. The instructions were very easy to understand and without much struggle (and a few beers), my installation was complete. 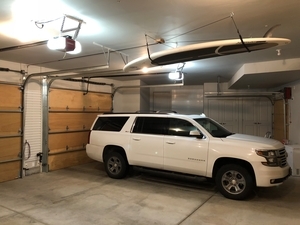 Product worked exactly as I hoped and now I am able to store my board above our opened garage door, freeing up much needed space. I would definitely recommend the product and Store Your Board to others! This is a great solution for storing a board without taking up floor or wall space. Installed this on a back porch that has a 10' ceiling. All of the components are high grade and everything I needed was in the box with the exception of a cleat to tie off the line when the board is pulled up into the ceiling. The instructions are complete, but it still takes some thinking. Lay everything out before hand and think through how it is going to work before you start. Look at how high the board needs to be pulled up and adjust the "bridles" accordingly. If they are too long, the board won't pull all the way up. It probably took me an hour including adjustments. I have used it at least a dozen times and the hoist still performs flawlessly. Since we have this on a porch, outside, at a bay house where we get pretty good wind - I place a 10" boat fender (something compressible) between the board and the ceiling. This allows me to pull the board up snug so it doesn't blow around. Great product, well designed, quality materials. Easy to install. Works great. Love the quality of the hardware. I bought a second one for my daughter's board. How low does the board hang from the ceiling, when drawn all the way up to the ceiling? I am putting this in a garage, and want to make sure there is clearance for the door when it is opened. Our 4 point lift SUP Ceiling Hoist will lift and hold your board as high as your ceiling allows, up to a 10 foot ceiling maximum. The board will be held right up fairly close to the ceiling, so how low your board hangs will in part depend on the thickness and shape of your board, and the height of your ceiling. My sup needs to be raised from the floor of the garage to the ceiling. Is there enough rope to do this or is this designed to raise from the roof of a car to the ceiling? Our SUP ceiling hoist will hoist your SUP all the way from the floor, or from close to the floor/ground, as long as your ceiling is no more than 10 feet maximum. My garage ceiling is sloped. 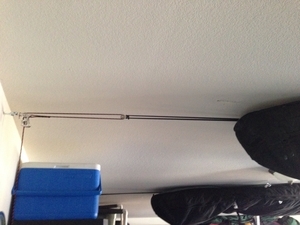 Will the hoist still hold the SUP level even if the pulleys are not mounted to a level ceiling? I'm trying to hang a SUP in a stairwell, it has to clear a door and hang on an angle for length. I imagine I could use a single bracket above the door header, and hoist the opposite end, with a single hoist. Have you seen someone to this?? Garageless. This hoist system would not be a workable solution in that angled stairwell, it would not mount properly or work securely. I haven't seen any hoistable system that would work in a stairwell as described. In some cases people will use a wall rack to hang a board at a very slight angle, with wall racks that have additional safety straps built into their system. I don't have a good alternative to suggest to you -- other than possibly exploring wall space you hadn't considered, for a wall rack, or maybe ceiling space for a ceiling rack that is more accessible then in the stairwell. I'm interested in this product for a porch storage solution for my SUP board. Now here is the tricky part of this question for your experts. I live on a second floor condo and want to be able to lower my board from the porch over my railing down to the grass on first floor below my porch. And then be able to strap it back in and hoist it back up to my porch & ceiling mount.Why? Because my place is so small and getting a SUP board in and out of my unit without damaging walls and then in/ out of elevator is an exhausting feat!Please please tell me you can help me with a long rope solution!! We do understand how tricky it can be to safely maneuver and store a SUP in small spaces! Unfortunately, we don't have a hoist recommendation for you, as this ceiling hoist system needs to be set up to lower the board directly up and down, and not over a railing or anything like that. It won't work safely, or properly, and would not be set up according to the manufacturer's instructions. We really don't have an alternative to suggest like it. Our only thought is that maybe using a well-padded board travel bag, to protect both the board and walls, for when you are taking the board in and out from your condo, in the elevator, etc, as you have been. The padding might protect board & walls and be a little bit easier to handle that way. Hi, for the SUP Ceiling Hoist | 4-Point Lift System, our ceiling is just over 10' (10'6" to be exact), would you recommend the 10' or 16' hoist then? Thanks. 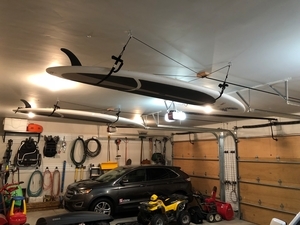 The larger size of this SUP hoist, that works for ceilings up to 16 feet, would technically be better suited for a ceiling that is over 10 feet tall. If you went with the 10 foot version, you would not be able to lower your SUP to the floor; so you would need a landing spot for the SUP that it could reach, or know it would be lowered to a half a foot or so above the floor (and that would be where you would be placing the SUP into the hoist. 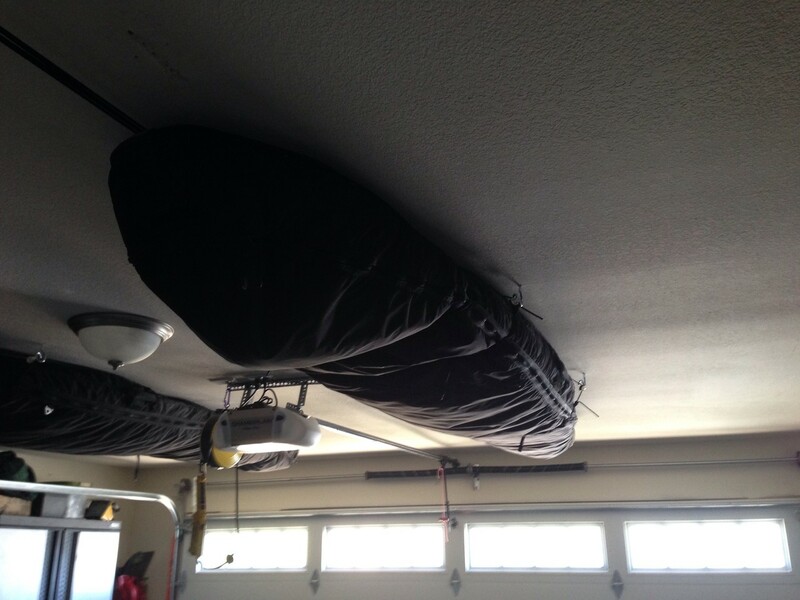 If you plan to be lowering it to the roof of your vehicle, that may not be an issue and could work so you could probably go that route, but the one for ceilings up to 16 feet would be the choice for ceilings taller than 10 feet normally. I want to lift a 4’ x6’ plywood platform holding my light weight sun screens (AZ) for winter storage. Would this pulley system work? This 4-point pulley system should work well for your intended use. One note, while it can hoist and hold up to a maximum of 45 lbs, it requires a minimum weight of 10 lbs in order for it to lift & lower -- so your plywood platform and screens would need to weigh at least 10 lbs or you would need to add a bit of weight for them to work. Then you would be following the mounting instructions to set it up with the distance between the mounting boards being about 1/3rd of the length of the object you are hoisting -- so they would be mounted approximately 2 feet apart to your ceiling joists, for planning purposes (and the complete installation instructions can be found on our listing, should you wish to reference them ahead of purchase). I think it would work well for your purposes though.